On his throne, wearing a red tunic and holding the globe of the World in his left hand, Christ offers his blessing with his right. He is flanked by figures representing the Church and the Synagogue and surrounded by the Tetramorph. Christ is presented as the Savior of the world in this work that contrasts the figure of the Synagogue, with Moses’s tablets and a torn banner; and the figure of the Church, who wears a laurel crown and bears the flag of Victory and a chalice with the Host as a symbol of the new promise of death and Resurrection through Christ. His Word, recorded in the Gospel of the New Testament, is represented by the Tetramorph, the symbols of the four evangelists: the eagle of Saint John, the bull of Saint Luke, the lion of Saint Mark and the angel of Saint Matthew. This work’s gothic architecture, composition and pictorial technique make it a fine example of Gallego’s refined style, steeped in Flemish elements. It comes from the church of San Lorenzo de Toro and, while traditionally considered part of an altarpiece, it must actually have been made for the tombs in which don Pedro de Castilla el viejo and his wife, Beatriz Rodríguez de Fonseca y Ulloa where buried in 1492. Technical studies carried out at the Museo del Prado have revealed an important change in this work’s iconography. First, the painter drew Christ wearing a crown, with the Lamb over the Book of the Seven Seals at his feet. This was never actually painted, but it is visible in the underlying drawing. That image is quite different than the one on the surface of this work, and the changes were probably not the painter’s decision. It seems likely that his client saw the work when it was only sketched in and ordered the change, converting the initial Christ as judge of the Apocalypse to Christ offering his blessings. There is no documentation in Castile of this control by clients (or their representatives) during the creative process, but the extraordinary manner of shading the scenes that were eventually hidden, and the change of approach that we just mentioned, suggest the scenario we have described (Text drawn from Alba, L., García-Máiquez, J., Gayo, M. D., Jover, M., Silva, P.: "Las prácticas artísticas de los pintores hispanoflamencos en la Corona de Castilla en el siglo XV", Boletín del Museo del Prado, XXXII, 50, 2014, p. 136). Height: 169 cm. ; Width: 132 cm. F. Kleinberger, 1913; Legacy of Pablo Bosch y Barrau, 1916. Hymans, H., L'Art Flamand et Hollandais. L'Exposition de la Toison D'Or, Librairie Nationale D'Art & D'Histo, Bruselas.Paris, 1907, pp. 82/ lám. IV. Mayer, A. L., Die ''Altspanische Ausstelung'' in der Galerie Heinemann in München, DER CICERONE, 1911, pp. 51-59. Museo Nacional del Prado, Catalogo provisional de las obras de arte legadas al Museo del Prado por D. Pablo Bosch, Madrid, 1916, pp. nº15. Garnelo y Alda, J., Los primitivos españoles de la colección Bosch en el Museo del Prado, ARTE ESPAÑOL / REVISTA ESPAÑOLA DE ARTE, 3, 1917, pp. 356-359. Gómez Moreno, Manuel y Sánchez Cantón, Francisco Javier, Sobre Fernando Gallego, ARCHIVO ESPAÑOL DE ARTE Y ARQUEOLOGIA, 3, 1927, pp. 352. Mayer, August L., Historia de la Pintura Española, Espasa Calpe, Madrid, 1928, pp. 138. Post, Chandler Rathfon, A history of Spanish painting, Harvard University Press, Cambridge, 1933, pp. 109-110. Gaya Nuño, Juan Antonio, Fernando Gallego, Instituto Diego Velázquez, Madrid, 1958, pp. 25 / lám. 39. Quinn, R.M., Fernando Gallego and the retablo of Ciudad Rodrigo /, The University of Arizona Press, Tucson, 1961, pp. 39-40. Tüngel, Richard, 400 Jahre Kunst, Kultur, und Geschichte im Prado, Schweizer Verlagshaus, Zurich, 1964, pp. 28 / lám. 7. Cabrera, José Mª y Garrido, Mª del Carmen, Dibujos subyacentes en las obras de Fernando Gallego, Boletín del Museo del Prado, IV, 1981, pp. 29-33. Palomino de Castro y Velasco, Acisclo Antonio 1653-1726, Vidas, Alianza Editorial, Madrid, 1986, pp. 29. Bialostocki, Jan, Il Quattrocento Nell'Europa Settentrionale, Utet, Turin, 1989, pp. 104. Alberti, R., Mirar un cuadro en el Museo del Prado, R.T.V.E. y Lunwerg Editores, Madrid, 1991, pp. 47. Karge, Henrik, Vision Oder Wirklichkeit. Die Spanische Malerei Der Neuzeit, Klinkhardt & Biermann, Munich, 1991, pp. 20. Buendía, José Rogelio, El Prado. Colecciones de Pintura, Lunwerg Editores, Barcelona, 1994, pp. 49. La Pintura Española, Electa, Milán, 1995, pp. 179. 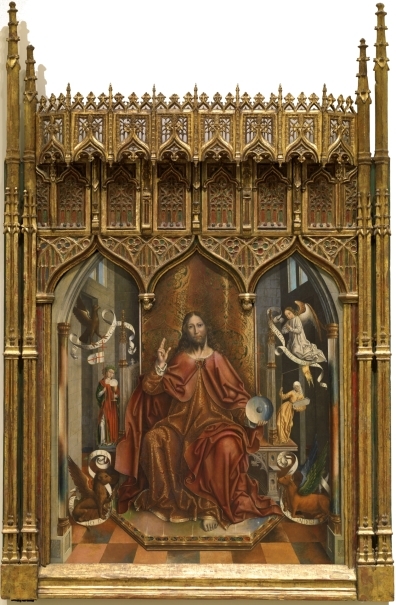 Kovács, Zoltán, A new representation of the Salvator Mundi from the workshop of Quentin Massys, BULLETIN DU MUSEE HONGROIS DES BEAUX-ARTS = BULLETIN A SZEPMUVESZETI MUZEUM KOZLEMENYEI (BUDAPEST), 96, 2002, pp. 93. Portús, Javier, La Colección de Pintura Española en el Museo del Prado, Edilupa, Madrid, 2003, pp. 32. Silva Maroto, María Pilar, Fernando Gallego, Caja Duero, Salamanca, 2004, pp. 190. Museo Nacional del Prado, El trazo oculto: dibujos subyacentes en pinturas de los siglos XV y XVI, Museo Nacional del Prado, Madrid, 2006, pp. 184, nº 11. Bourdais, Gildas, Visions célestes, visions cosmiques, Éd. 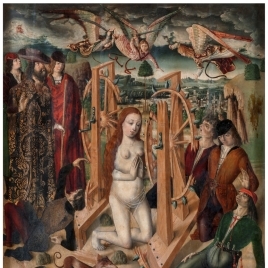 le Temps présent, 2007, pp. 121. Museo Nacional del Prado, Las aves en el Museo del Prado, SEO/BirdLife, 2010, pp. 68,224. Alba, L. García-Máiquez, J. Gayo, M. D. Jover, M. Silva, P., Las prácticas artísticas de los pintores ''hispanoflamencos'' en la Corona de Castilla en el siglo XV, Boletín del Museo del Prado, XXXII, 2014, pp. 122-147 [130,132,135-138,140,142, f.6a, f.6b]. Alba, L.; García-Máiquez, J.; Gayo, M. D.; Jover, M.; Silva, P., Las prácticas artísticas de los pintores ''hispanoflamencos'' en la Corona de Castilla en el siglo XV, Boletín del Museo del Prado, XXXII, 2014, pp. 122-147 (130, 132, 135, 140, 142). Inv. Nuevas Adquisiciones (iniciado en 1856). Núm. 1395. Orb / Sphere: Representación de Jesús como Salvador, mostrando el orbe en la mano izquierda y elevando la derecha en actitud de bendecir. Estos objetos singulares suelen mostrar una transparencia y brillo que podría hacer pensar en piezas de vidrio. Sin embargo, su gran tamaño permite descartar el supuesto de que fueran de vidrio y, mucho menos aún, de cristal de roca. Lo más probable es que dada su rareza, en la mayoría de los casos no se tratara de piezas reales copiadas del natural, sino pintadas imaginativamente por el artista (Fernández Navarro, J. M.; Capel del Águila, F.: El vidrio en la pintura del Museo Nacional del Prado, 2012).